The nutrition label for WUNDERGrubs cookies lists familiar ingredients like flour, sugar, baking powder, vanilla extract and chocolate chips, along with one oddball: mealworms. Founded in 2016, WUNDERGrubs sells a variety of cookies, all containing roasted, powdered mealworms. Initial skepticism about eating the insect-based cookies is common, founder Akissi Stokes (92Ox, 94C) said. 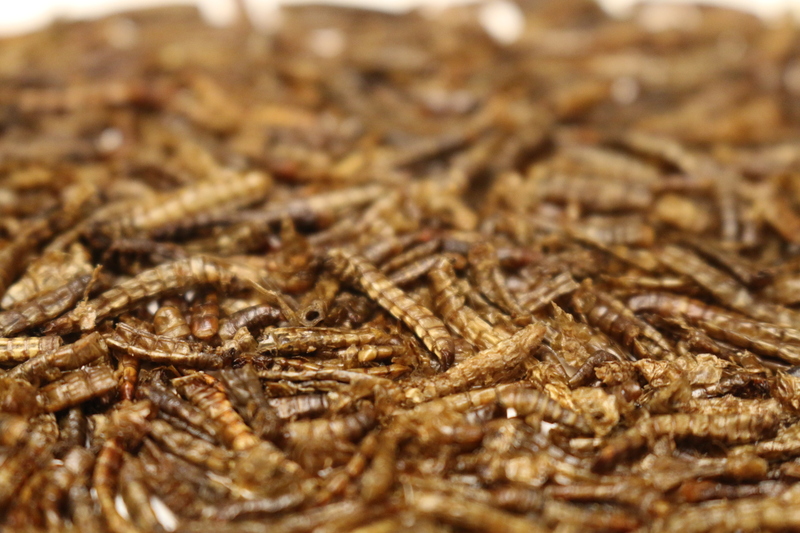 With WUNDERGrubs, Stokes aims to normalize entomophagy, the consumption of insects, in Western diets. She drew inspiration from the environmental issues she saw during her travels in Africa and Latin America, as well as her upbringing on a Georgia farm. With this global and environmental perspective in mind, Stokes said the sparks started to fly while watching an episode of “Anthony Bourdain: No Reservations.” Bourdain travelled to Haiti after the 2010 earthquake and decided to feed locals by buying a soup kitchen. But because so many Haitians were desperate for food, the effort quickly devolved into a riot. The next step for Stokes was research. She began studying insects, and came across a report from the United Nations’ Food and Agriculture Organization, which noted that insect agriculture could serve as a supplement to combat food scarcity crises. “So I thought, ‘What can I grow to feed people, but that also saves the planet?’ ” Stokes said. Initially, Stokes settled on crickets, but she discovered they require living conditions with high humidity and made too much noise to grow and experiment with. She searched for other options, and finally stumbled upon two German researchers investigating the benefits of mealworm consumption. Stokes said she ordered 10,000 mealworms of the species Tenebrio molitor and started growing them in a closet in her home, feeding them fruits, which supply both nutrients and water to the worms. Having found a food source that met her criteria of sustainability and affordability, Stokes now faced the issue of making the worms palatable to the general public, many of whom have a strong aversion to eating insects. “Everyone loves a good cookie,” Stokes said. As she developed her ideas, Stokes gained the help of small business accelerators, including Start:ME, an accelerator associated with the Emory University Goizueta Business School. Stokes said that Start:ME helped her refine a business model. As a socially conscious entrepreneur, Stokes also commended the program for helping to build communities using small business. “Start:ME was one of the few programs that I saw who truly seemed to be … in marginalized neighborhoods saying, ‘How can we grow from the inside out?’ ” Stokes said. Stokes expressed pride that the Start:ME program came from her alma mater. During her time as an undergraduate at Oxford and Emory, Stokes studied economics and finance. She has been working in finance since graduation, in addition to founding her WUNDERGrubs company. She said one advantage Emory provided was networking and exposure. Since its founding, WUNDERGrubs has established an online store and sold cookies at a variety of farmers markets, festivals and tasting sessions. Stokes said that most customers who try her cookies express surprise. In the near future, Stokes sees herself moving beyond her own cuisine to become a supplier of mealworms to other food companies. Her motivation to transition to supplying mealworms comes in part from her observations that other insect-food companies receive their mealworms from outside the United States, which she views as unsustainable. Stokes envisions teaching people how to start their own small grub farms and collect and sell the harvests as products. For her goal of becoming a mealworm supplier, Stokes was recently selected to become a Food Innovation Fellow with the Center for Civic Innovation, an Atlanta non-profit. Executive Director of the Georgia Farmers Market Association Sagdrina Jalal, one of the mentors for Food Innovation Fellows, was one of the first of Stokes’ colleagues to suggest farming mealworms. When they met at a farmers market, Jalal said was struck by how knowledgeable Stokes was about her product; she came across as very community-minded. Jalal was also surprised that the mealworm cookies were succeeding with market-goers. For the next several months, with the help of the the Center for Civic Innovation, Stokes will work toward becoming a supplier. Besides selling cookies, Stokes also plans to expand her menu to include potential items such as caramel-covered mealworms as ice-cream toppings.